President Donald Trump is declaring a "big win" for him and his party. President Donald Trump at a press conference where he sparred with some reporters claimed that he "stopped the blue wave" by Democrats through his heavy campaigning for Republican candidates ahead of the midterm elections. Meanwhile, more than a dozen races across multiple states have yet to be called, including contests in Arizona and Florida for the U.S. Senate and in Georgia for governor. A Senate special election in Mississippi has gone to a runoff. Wednesday, 1:42 p.m. EST -- House Minority Leader Nancy Pelosi said her fellow House Democrats succeeded in Tuesday's midterm elections because their campaigns were centered on health care. She called it a "great day for America." "The biggest winner yesterday was health care for the American people, for our seniors and for American families," Pelosi said. "We won because from the beginning we focused on health care." Wednesday, 1:20 p.m. EST -- Montana's Senate race is projected to be over, with incumbent Democrat Jon Tester the winner. Tester, who is projected to have won a third term by defeating Republican challenger Matt Rosendale, was one of 10 Democratic incumbents up for re-election in states that Trump won in 2016. Democrats have won six of the seats and Republicans three. The Florida Senate race result has not been projected by ABC News. Wednesday, 1:00 p.m. EST -- Trump at a White House news conference quarreled with some reporters and declared that his campaigning for Republican candidates in the weeks ahead of Tuesday's midterms "stopped the blue wave" of big, expected Democratic wins. "This vigorous campaigning stopped the blue wave that they talked about. I don't know if there ever was such a thing, but there could have been if we didn't do the campaigning," the president said, noting that he held 30 rallies for Republicans over the last 60 days. "We saw candidates that I supported achieve tremendous success last night." Wednesday, 11:37 a.m. EST -- Senate Majority Leader Mitch McConnell has warned Democrats against "presidential harassment" as they take the reins in the House of Representatives. McConnell, a Republican from Kentucky, recalled his own party's efforts to impeach President Bill Clinton in the 1990s, saying it backfired on them. "The whole issue of presidential harassment is interesting. I remember when we tried it in the late '90s," McConnell said. "We impeached President Clinton. His numbers went up and ours went down, and we under-performed in the next election." House Democrats swept to power after campaigning on the promise of providing a stronger check on the Trump administration. That pledge could initiate bruising legal battles over congressional subpoenas, a stack of demands for documents and testimony from federal agencies -- including the president's tax returns -- and withering investigations into facets of Trump’s personal life, his family business and his government. 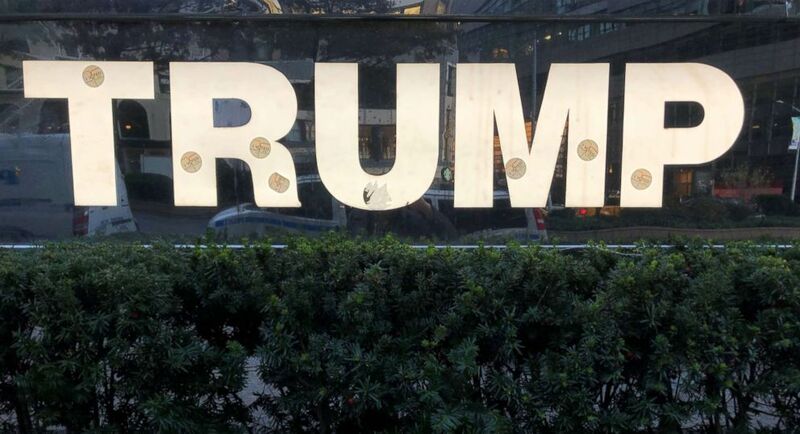 (Tom Liddy/ABC News) A sign at Trump International Hotel in New York City with "I voted" stickers the morning after the midterm election, Nov. 7, 2018. Wednesday, 10:36 a.m. EST -- Florida Democratic incumbent Sen. Bill Nelson has called for a recount in his race for re-election after unofficial results appear to show him narrowly trailing behind Republican opponent Rick Scott, who is currently the state's governor. "We are proceeding to a recount," Nelson said in a brief statement Wednesday morning, in which he called Scott's lead "razor-thin." A recount of all votes is mandatory in Florida if the margin of victory is less than 0.5 percentage points. But Scott has already declared victory. "This race is over. It's a sad way for Bill Nelson to end his career. He is desperately trying to hold on to something that no longer exists," Scott’s spokesman, Chris Hartline, said in a statement to ABC News. 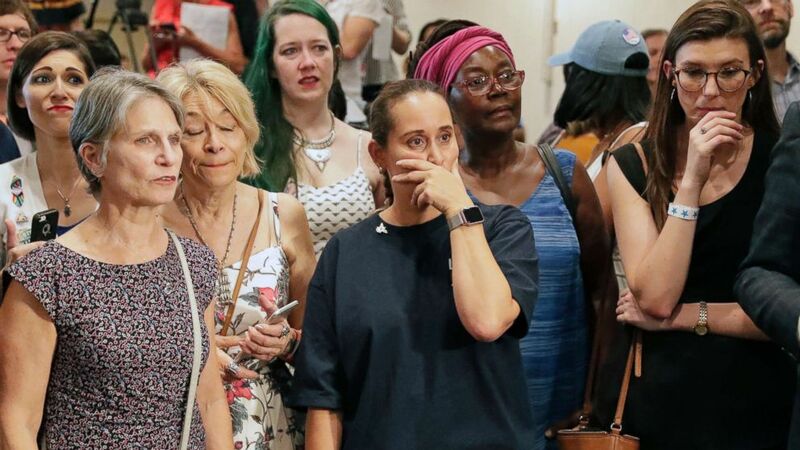 (John Raoux/AP) Democratic supporters react as the results for the state senate race lead slips to a virtual tie during at an election party for Sen. Bill Nelson, Nov. 6, 2018, in Orlando, Fla.
Wednesday, 10:02 a.m. EST -- Republican Bob Stefanowski has conceded to Democrat Ned Lamont in Connecticut's surprisingly tight gubernatorial race. Stefanowski made his concession during a call-in to a radio show Wednesday morning, which means Lamont will take the seat of the state's outgoing governor, Democrat Dan Malloy. Wednesday, 9:58 a.m. EST -- Democrat Jane Mills will be the next governor of Maine. Maine uses ranked-choice voting, in which voters list candidates in order of preference with their votes shifting to the next choice as other candidates are eliminated, which led to some concerns that the governor's race could drag out for days. But Mills captured a majority in the first round. Wednesday, 9:48 a.m. EST –- Alaska's new governor is Republican Mike Dunleavy. His path to victory became clearer when incumbent Independent Gov. Bill Walker dropped out of the race nearly three weeks ago. Walker threw his support behind Democratic candidate Mark Begich, but Dunleavy picked up the seat for the GOP. Wednesday, 9:22 a.m. EST -- As Democrats prepare to take control of the House, Republicans will decide who will be their minority leader. Rep. Jim Jordan, R-Ohio, is challenging Rep. Kevin McCarthy, R-Calif., for the position. Jordan announced his bid during an interview with The Hill on Wednesday morning, saying he plans to run for the post. An aide subsequently confirmed that to ABC News. Wednesday, 8:45 a.m. EST -- Trump railed against House Minority Leader Nancy Pelosi for months on the campaign trail, warning his supporters of the possibility of her becoming speaker if Democrats won control of the House. But in the wake of exactly that happening in Tuesday's midterm elections, Trump took a different track, tweeting that "in all fairness," that the California Democrat "deserves" to be chosen by her fellow House members as speaker. (Erik S. Lesser/EPA via Shutterstock) Democratic House Minority leader Nancy Pelosi reacts to early returns from the 2018 midterm general election during a House Democratic Election Night event at the Hyatt Regency in Washington, Nov. 6, 2018. Wednesday, 8 a.m. EST -- Trump continued Wednesday morning to spin the midterm elections as a win for him and his party. "Yesterday was such a very Big Win, and all under the pressure of a Nasty and Hostile Media!" Trump wrote in a series of tweets Wednesday morning. 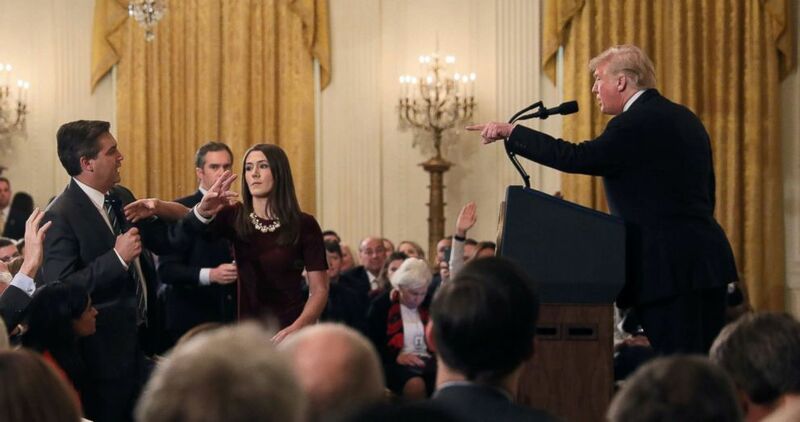 "To any of the pundits or talking heads that do not give us proper credit for this great Midterm Election, just remember two words - FAKE NEWS!" Wednesday, 5:23 a.m. EST -- The Kremlin offered its two cents (or rubles) on the midterm results, saying that even with the change in Congress, it was hard to see how relations between Russia and the U.S. could get worse. "It’s possible to suggest with a high degree of confidence, that of course there is no rosy outlook for normalizing Russian-American relations on the horizon. That does not mean that we will not seek dialogue, we want dialogue,” Kremlin spokesman Dmitry Peskov said in a daily briefing call Wednesday. Wednesday, 2:23 a.m. EST -- Democrat Joe Cunningham has defeated Republican Katie Arrington in South Carolina’s 1st Congressional District. Wednesday 2:18 a.m. EST -- Republican Yvette Herrell has defeated Democrat Xochitl Torres Small in New Mexico’s 2nd Congressional District, ABC News can project. Herrell is the first woman to represent the district. Wednesday 1:48 a.m. EST -- Democrat Lauren Underwood will become the first black woman to represent her district, in Illinois’ predominately white 14th Congressional District, ABC News can project based off of exit polls. Wednesday 1:37 a.m. EST -- Twenty-one congressional districts voted for President Barack Obama and then for President Trump. The GOP was able to hold down 12 of them in Congress. ABC News can project that Democrats will flip six of those seats. 21 congressional districts voted for President Obama and then Pres Trump. GOP held 12 in Congress. As of now, ABC News projecting Dems will flip 6 .... Rs projected to hold 4. Last 2 outstanding-- Maine 2 and NJ 3. Wednesday 1:30 a.m. EST -- In Georgia, a vote count error in the state has narrowed the lead of Republican candidate Brian Kemp over Democratic candidate Stacey Abrams. Kemp is just above the 50 percent threshold. If his share of the vote falls below 50 percent, Georgia law states that the race would go to a runoff. The Abrams campaign said that they don't expect to concede tonight, and that they believe there are enough votes still outstanding to force a runoff. "We are going to make sure every single vote is counted," Abrams said. Wednesday, 1:25 a.m. EST -- Democrat Lizzie Pannill Fletcher has defeated GOP Rep. John Culberson in Texas’ 7th Congressional District, which includes the Houston suburbs, ABC News can project. Wednesday, 1:00 a.m. EST -- In Maine, another governorship will likely flip in favor of Democrats at the gubernatorial level. Republican candidate Shawn Moody has conceded to Democratic candidate Janet Mills. ABC News has not yet projected a winner in the race. 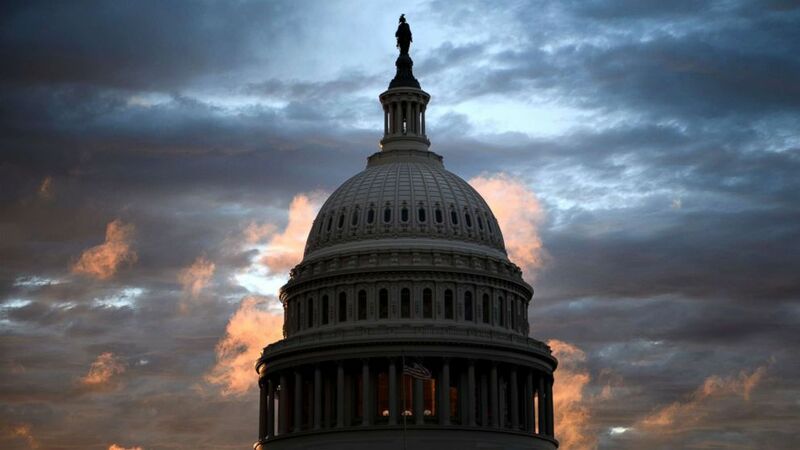 Wednesday, 12:49 a.m. EST -- The Democrats will pick up between 32 and 36 seats in the House, ABC News can project. Wednesday, 12:41 a.m. EST -- Republican Rep. Steve King has won re-election to Iowa’s 4th Congressional District, fending off Democratic challenger J.D. Scholten, ABC News can project. 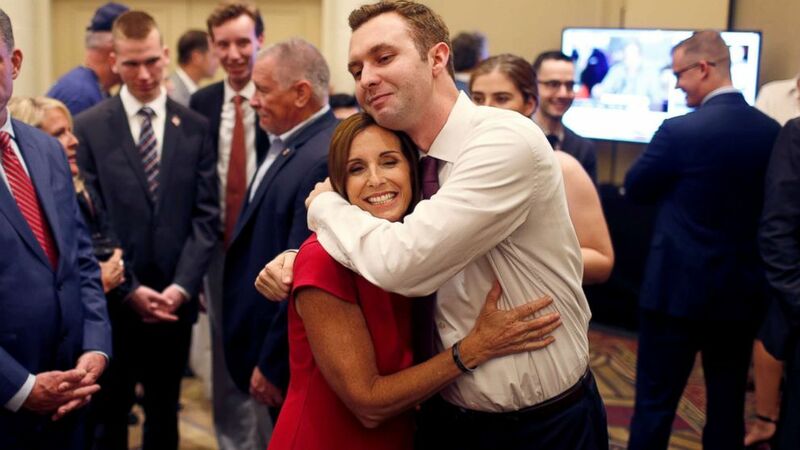 Wednesday, 12:38 a.m. EST -- The crowd at the Democratic Election Night party in Phoenix was at first buoyed by hope and lively music, but started to thin out as it seems more and more likely that Arizona's U.S. Senate race might be too close to call tonight. The race between Democrat Rep. Kyrsten Sinema and Republican Rep. Martha McSally to fill Sen. Jeff Flake's seat is neck-and-neck. Sinema supporter Michelle Rose predicted they'd have a winner by 11 p.m. MST (1 a.m. EST), and Timothy Bradley said he thought it'd be either by 11 p.m. or 12 a.m. Ginny Doherty left a little more wiggle room, telling ABC News she thought it would be closer to 2 a.m. MST. According to officials, those guesses could be way off. Part of the problem is that there are still hundreds of thousands of votes that still need to be tabulated in the state's most populous county, Maricopa County, which includes Phoenix. Maricopa County Recorder Adrian Fontes told ABC News tonight that it could take up to a week or more for Maricopa to have their final results. (Nicole Neri/Reuters) Republican Senate candidate Rep. Martha McSally greets voters in a holding room outside of her election night party in Phoenix, Nov. 6, 2018. Sinema and McSally are battling it out for the seat that's being left open by Sen. Jeff Flake's decision not to seek re-election. Preliminary exit poll results suggest that Sinema is getting help by moderate Arizonans, with a 27 point margin that has her up 63 percent to McSally's 36 percent. That appeal, and her perceived independent streak, is what drew Matt Winter to volunteer for Sinema. "In recent history we’ve had John McCain and Jeff Flake and Republicans who have a strong independent streak, and she’s a Democrat with a strong independent streak," Winter told ABC News. Wednesday, 12:18 a.m. EST -- Whatever the results in any given election, the rise in diversity is nothing short of remarkable. In the 1990 midterm elections, the division of whites and nonwhite voters was 91-9 percent. Today it’s 72-28 percent. The most non whites voters ever in a midterm, and a scant 1 point shy of the record for any election in 2016. The Hispanic vote came in at 11 percent, again a new midterm high, and matched its all-time high from 2016. Wednesday, 12:15 a.m. EST -- Democrat Antonio Delgado will defeat incumbent GOP Rep. John Faso in New York’s 19th Congressional District, ABC News can project based off of an analysis of polling data. "Big-city rapper" Antonio Delgado will defeat Rep. John Faso in #NY19, ABC News can project. Wednesday, 12:10 a.m. EST -- In Iowa, ABC News can project incumbent Republican Gov. Kim Reynolds has narrowly won re-election in a tight race with Democratic challenger Fred Hubbell. Wednesday, 12:06 a.m. EST -- Democrat Alexandria Ocasio-Cortez Alexandria Ocasio-Cortez is the youngest woman in Congress, ABC News can project based off of an analysis of polling data. Tuesday, 11:57 p.m. EST -- Democrat Ilhan Omar Ilhan Omar is projected to win Minnesota’s 5th Congressional District. Alongside Democrat Rashida Tlaib in Michigan’s 13th Congressional District, Omar is now one of the two first Muslim women in Congress. Tuesday, 11:53 p.m. EST -- Democrat Deb Haaland is on track to win in New Mexico's 1st Congressional District, ABC News projects based on exit polls. Haaland is the first Native American representative from New Mexico and now joins Democrat Sharice Davids, projected to win a House seat in Kansas, in becoming the first two Native American women ever elected to Congress. 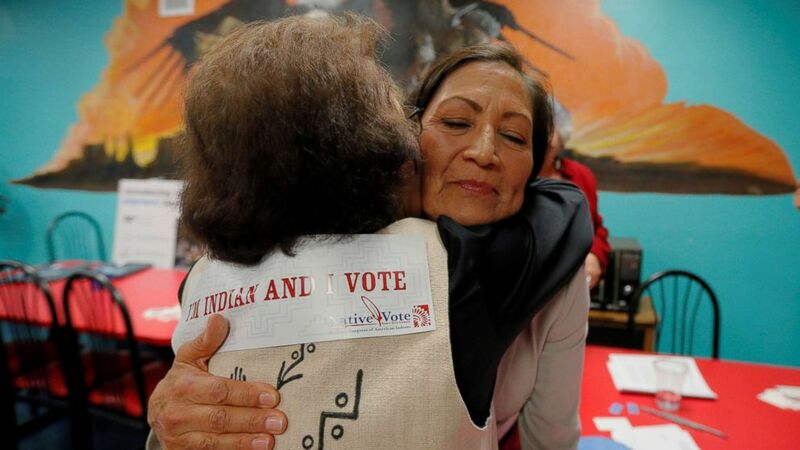 (Brian Snyder/Reuters) Democratic Congressional candidate Deb Haaland hugs a supporter at a Native Vote Celebration on midterm elections night in Albuquerque, N.M., Nov. 6, 2018. Tuesday, 11:48 p.m. EST -- Republican Josh Hawley has defeated Democratic Sen. Claire McCaskill, ABC News projects, based on analysis of voting data. McCaskill, who has conceded, was one of the ten Democratic Senators running in states Trump won in the 2016 presidential election. Tuesday, 11:46 p.m. EST -- Sen. Heidi Heitkamp conceded to opponent Rep. Kevin Cramer in North Dakota's U.S. Senate race. Heitkamp called North Dakota "a 36 point state," the margin by which Trump won there in 2016, and said she knew it was an uphill battle from the start. "We knew we were in a tough campaign. We knew we took some votes that people were critical of," Heitkamp said, an apparent reference to her vote against Justice Brett Kavanaugh’s confirmation to the Supreme Court. But Heitkamp said she never intended to "to rubber stamp any one party." "This has been the honor of a lifetime," she added, encouraging her supporters not to be bitter about the results. Tuesday, 11:41 p.m. EST -- In a strong display of the range of seats Democrats have been able to flip tonight, ABC News can project a win for the party in the deep red state of Oklahoma, in the state's 5th Congressional District. Democrat Kendra Horn is projected to defeat incumbent GOP Rep. Steve Russell in another upset, based on vote analysis. The district is anchored by Oklahoma City but also includes more rural areas of the state. Trump won this district by roughly 13 points in 2016, but won the state of Oklahoma overall by just over 36 points in the 2016 election. Tuesday, 11:38 p.m. EST -- ABC News has now projected all the competitive races in Pennsylvania. The congressional delegation in Pennsylvania now stands at an even 9-9. Two years ago, election night ended under the previous congressional map, which was redrawn before the 2018 midterm election, at 13-5 in favor of Republicans. Tuesday, 11:37 p.m. EST -- Democrat Abigail Spanberger has defeated GOP Rep. Dave Brat in Virginia’s 7th Congressional District, ABC News can project based off of exit polls. Brat unseated then-GOP House Minority Leader in the 2014 primary. Tuesday, 11:37 p.m. EST -- Democrat Elaine Luria defeated Republican Scott Taylor in Virginia’s Second Congressional District, ABC News can report based off of an analysis of polling data. Tuesday, 11:30 p.m. EST -- Democrat Sen. Joe Manchin's projected win in West Virginia tonight comes despite a major effort on the part of Trump and his family to flip his seat. Lara Trump and Donald Trump Jr. frequently came to West Virginia to stump for Attorney General Patrick Morrisey and Republican House candidate Carol Miller and the president's son was in West Virginia with Kimberly Guilfoyle as recently as yesterday. Trump held rallies in West Virginia a whopping five times in an effort to turn a state he won by 42 points red all the way. Tuesday, 11:28 p.m. EST -- Although ABC News can project the U.S. Senate race in North Dakota for Republican Kevin Cramer, Democratic incumbent Sen. Heidi Heitkamp hasn’t conceded just yet. Heitkamp's team says she's not watching the returns -- she’s out at the movies. Her choice tonight? According to her campaign: A Star is Born. Tuesday, 11:27 p.m. EST -- Democrat Angie Craig defeated Republican Jason Lewis in the Minneapolis suburb area of Minnesota’s 2nd Congressional District, ABC News can project based on analysis of the polls. Democrats also won in the deep red state of Oklahoma in the state’s 5th Congressional District. Kendra Horn defeated incumbent GOP Rep. Steve Russell in a district anchored by Oklahoma City, but that also includes more rural areas of the state. Tuesday, 11:20 p.m. EST -- In Michigan, ABC News can project that Democrat Gretchen Whitmer has defeated Republican Bill Schuette, flipping the governorship from Republican to Democrat in a state that narrowly went for Trump in the 2016 presidential election. Tuesday, 11:18 p.m. EST -- Trump has weighed in claiming "tremendous success," though the House of Representatives is projected to flip to the Democrats. Republicans will retain the Senate, ABC News projects. Tuesday, 11:05 p.m. EST -- In Florida, Democratic gubernatorial candidate, Tallahassee Mayor Andrew Gillum, has conceded to Republican Ron DeSantis. Gillum said in a speech to supporters that while "we recognize that we didn't win this tonight," that "we still have to be willing to show up every single day and demand a seat at the table." Tuesday, 11:00 p.m. EST -- Sen. Debbie Stabenow is on track to win re-election in Michigan, ABC News projects, based on analysis of voting data. Stabenow was one of 10 Democratic Senators running in states Trump won in the 2016 presidential electoin. 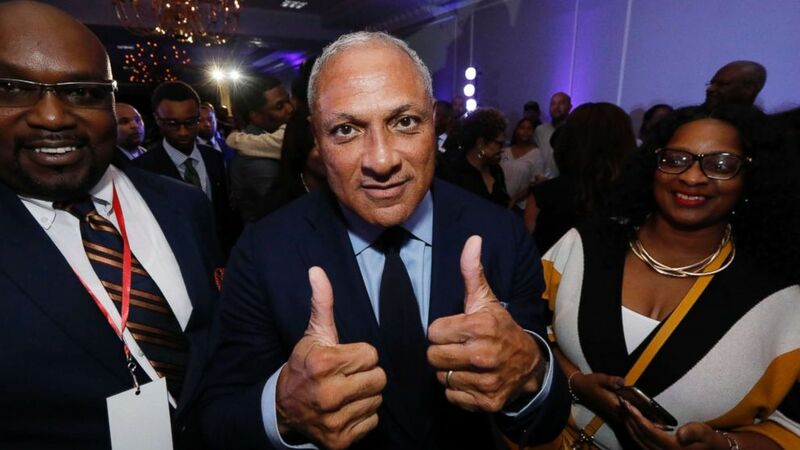 Tuesday, 11:00 p.m. EST -- ABC News can project that, based on exit polls, the U.S. Senate special election in Mississippi has gone to a runoff between Republican Sen. Cindy Hyde-Smith and Democrat Mike Espy. (Rogelio V. Solis/AP) Mike Espy who is seeking to unseat appointed Sen. Cindy Hyde-Smith and serve the last two years of the six-year term vacated when Republican Thad Cochran retired for health reasons, gives a "thumbs up" following his speech before a crowded ballroom in Jackson, Miss., Nov. 6, 2018. Tuesday, 10:58 p.m. EST -- ABC News projects that the Democrats will win enough seats to gain control of the House. Democrats will pick up at least 23 seats. 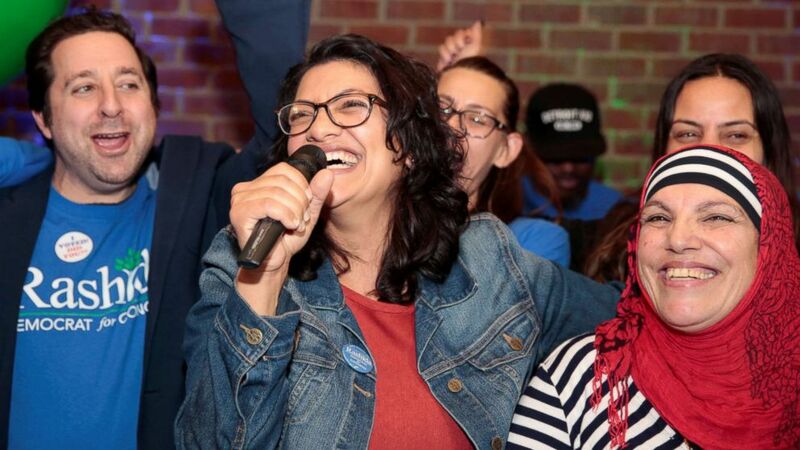 Tuesday, 10:55 p.m. EST -- With no Republicans or Independents running for Michigan’s 13th Congressional District, Rashida Tlaib is favored to win and poised to become the first Muslim-American woman in Congress. (Rebecca Cook/Reuters) Democratic congressional candidate Rashida Tlaib celebrates with her mother at her midterm election night party in Detroit, Nov. 6, 2018. Tuesday, 10:40 p.m. EST -- Sources close to Trump told ABC News that, among many items, the focus right now -- "he’s watching Florida." “He campaigned a lot there so if [Gov. Rick Scott] and [Rep. Ron DeSantis] pull this off it’s all thanks to him,” said one high ranking source about the president's efforts in the Sunshine State. Trump often refers to Florida as his second home. Sources told ABC News the president is thrilled with results from states he campaigned in like Indiana and North Dakota. Tuesday, 10:15 p.m. EST -- Republican Rep. Kevin Cramer is on track to win the U.S. Senate race in North Dakota against incumbent Democratic Sen. Heidi Heitkamp, ABC News projects, based on analysis of voting data. Tuesday, 10:10 p.m. EST -- Republican Sen. Ted Cruz is on track to win re-election in Texas, ABC News can project based on exit polls, defeating Democrat Beto O’Rourke. 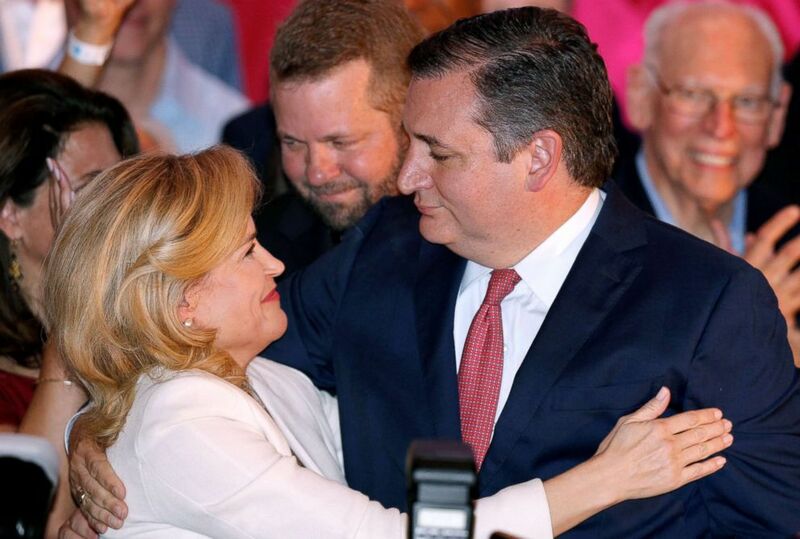 (Jonathan Bachman/Reuters) Republican Senator Ted Cruz hugs his wife Heidi Cruz during his election night party in Houston, Texas, Nov. 6, 2018. Tuesday, 10:10 p.m. EST -- Democrat Mikie Sherrill is on track to win in New Jersey’s 11th Congressional District, ABC News can project based on exit polls. Sherrill will take over the seat from Republican Rep. Rodney Frelinghuysen, who has represented the district for more than two decades. Trump barely won the district in 2016. Tuesday, 10:01 p.m. EST -- ABC News can project that Democrat Dean Phillips has won in Minnesota’s 3rd Congressional District and Democrat . The Democrats have now picked up seven seats in the House tonight. Tuesday, 9:57 p.m. EST -- Sharice Davids is on track to win Kansas’ 2nd Congressional District, ABC News projects, based on exit polls. The political newcomer will be the first Native American lesbian woman elected to Congress. She’s also the second openly lesbian woman in Congress. Elected to represent Kansas’ 2nd Congressional District, Davids was a longshot in her campaign against four-term Republican Rep. Kevin Yoder. Tuesday, 9:42 p.m. EST -- In the third Democratic pick-up of the night, Rep. Connor Lambwill win his election against Rep. Keith Rothfus, ABC News can project based on exit polls. It was the only incumbent versus incumbent race in the nation. Tuesday, 9:40 p.m. EST -- In multiple Senate races, Sens. Amy Klobuchar of Minnesota, Kirsten Gillibrand of New York and Tammy Baldwin of Wisconsin are all on track to win their race, ABC News projects, based on voting data. Tuesday, 9:40 p.m. EST -- In Illinois, ABC News can project based on the vote that Democrat J.B. Pritzker will defeat incumbent Republican Gov. Bruce Rauner. This marks a flip in the statehouse for Illinois. Pritzker, the brother of former U.S. Secretary of Commerce Penny Pritzker, will become one of the wealthiest people to ever hold elected office in the U.S.
Tuesday, 9:36 p.m. EST -- Jared Polis is on track to win the gubernatorial race in Colorado, ABC News projects, based on exit polls. Polis will be the first openly gay man to win a U.S. gubernatorial election. Tuesday, 9:25 p.m. EST -- In Florida, Amendment 4 -- which provides voting rights for felons -- is on track to pass, according to ABC News projections, based on exit polls. There are currently more disenfranchised felons in that state, more than any other at 1.5 million. Previously, felons had to appeal directly to the governor. Tuesday, 9:23 p.m. EST -- Kim Davis, the county clerk who refused to issue marriage licenses to gay couples in Rowan County, Kentucky, lost her bid to a second term Tuesday night. In an upset, Davis was edged out by Democratic opponent, Elwood Caudill Jr., by about 700 votes, according to the Lexington Herald-Leader. Tuesday, 9:22 p.m. EST -- Republican Carol Miller is on track to win the seat in West Virginia’s 3rd Congressional District, ABC News can project based on exit polls. Miller ran against Democrat Richard Ojeda. Ojeda campaigned hard against big pharmaceutical companies in a deep-red district heavily hit by the opioid crisis. Tuesday, 9:07 p.m. EST -- Incumbent Democrat Joe Manchin is on track to win re-election in the senate race in West Virginia, ABC News projects, based on exit polling and analysis of voting data. Manchin was the only Democrat to vote to confirm Trump's Supreme Court pick, Justice Brett Kavanaugh. Trump went to West Virginia three times in the last four months. Tuesday, 9:06 p.m. EST -- Incumbent Republican Rep. Andy Barr is on track to win re-election in Kentucky’s 6th District, ABC News projects, based on exit polls. Democratic challenger Amy McGrath, a former Marine fighter pilot, was a key candidate for the party. Tuesday, 9:04 p.m. EST -- Republican Marsha Blackburn is on track to win the senate seat in Tennessee, ABC News projects, based on exit polls. 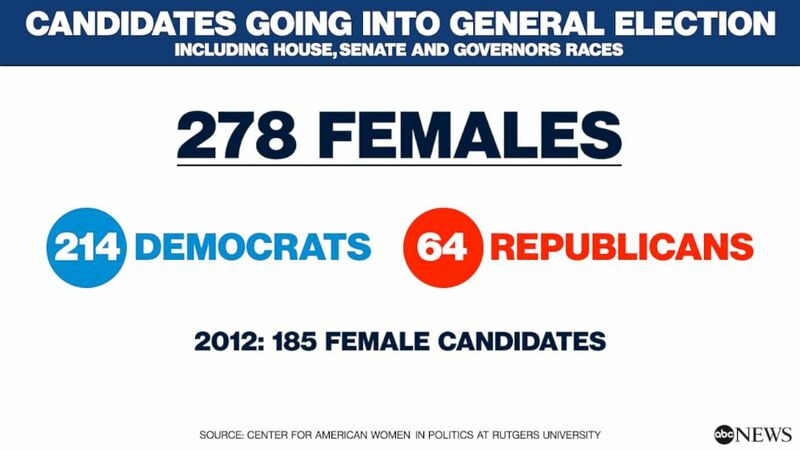 Blackburn will be the first female senator from the state. Trump went to Tennessee three times to rally for the congresswoman. She will take over the seat from Republican Sen. Bob Corker, a sharp critic of the president who did not run for re-election. Tuesday, 9:00 p.m. EST -- Polls are now closed in the closely watched states of Texas, North Dakota, Arizona, Michigan, Colorado, Louisiana, Kansas, Minnesota, Nebraska, New Mexico, New York, South Dakota, Texas, Wisconsin and Wyoming. Tuesday, 8:49 p.m. EST -- Democrat Donna Shalala is on track to win the House race in Florida’s 27th Congressional District, ABC News projects, based on exit polls. The district is currently served by Rep. Ileana Ros-Lehtinen, a Republican, who decided to retire in April of last year. The 77 year-old and President Clinton cabinet member won in a district that overwhelmingly voted for Hillary Clinton in 2016, turning the seat from red to blue. It's the second pick-up for Democrats in the House tonight. ABC News can also project the first GOP pick-up of the night in the Senate: Indiana. 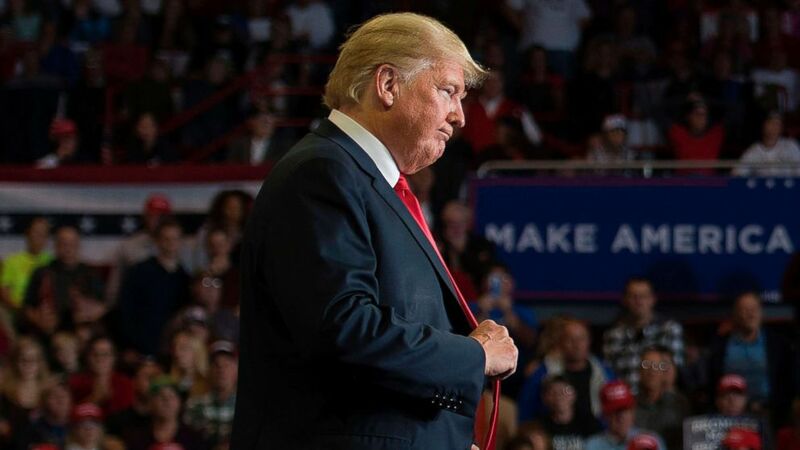 Incumbent Democrat Joe Donnelly is one of 10 Democratic incumbents up for re-election in states that Trump won in the 2016 presidential election, and Indiana is a state the president campaigned heavily in leading up to the 2018 midterms. Tuesday, 8:47 p.m. EST -- Another state has extended voting. Alabama now joins the list that also includes Georgia, Illinois, Indiana, North Carolina and Texas. Tuesday, 8:43 p.m. EST -- In what will only make it a harder battle for Democrats' effort to retake the Senate, Republican Mike Braun is on track to defeat Sen. Joe Donnelly in Indiana's U.S. Senate race, ABC News projects, based on exit polling and analysis of voting data. Tuesday, 8:35 p.m. EST -- ABC News can project, based on the vote, a few more gubernatorial races: in Massachusetts, Republican Gov. Charlie Baker, who is popular in Massachusetts despite the state's reputation for support of Democrats; in Pennsylvania, Democratic Gov. Tom Wolf; in Tennessee, Republican Bill Lee; and in Arkansas, Republican Gov. Asa Hutchinson. Tuesday, 8:32 p.m. EST -- Democrat Gina Raimondo is on track to win re-election for governor in Rhode Island, ABC News projects, based on exit polls. Tuesday, 8:30 p.m. EST -- The polls have closed in Arkansas. The next big wave comes at 9 p.m.
Tuesday, 8:26 p.m. EST -- Bob Menendez is on track to win re-election in New Jersey’s U.S. Senate race, ABC News projects, based on exit polling and analysis of voting data. Tuesday, 8:22 p.m. EST -- Health care is the top issue for voters, preliminary exit poll numbers show. Forty-two percent say health care is the top issue of four facing the country. Trump has pushed immigration hard but it’s the top issue to just 26 percent, far trailing health care. The economy comes in at 21 percent, preliminary exit poll numbers show. Tuesday, 8:22 p.m. EST -- Wondering who the president is watching the election results come in with? Watching with POTUS tonight — in addition to top WH advisers — Brad Parscale, Corey Lewandowski, Dave Bossie & longtime friends Tom Barrack and Richard LeFrak along with several mega donors close to POTUS. Tuesday, 8:19 p.m. EST -- Preliminary exit poll numbers show nonwhites account for 41 percent of Texas voters, including 24 percent Latinos. These are highs in Texas midterms in available exit polls back to 1984. Texas Republicans outnumbered Democrats by 9 points in the 2016 presidential election and 12 points in the 2014 midterms. Today it’s a 5-point gap, 33-38 percent, Democrats-Republicans. Tuesday, 8:10 p.m. EST -- Incumbent Democrat Elizabeth Warren is on track to win the race for senator in Massachusetts, ABC News projects, based on exit polls. Tuesday, 8:07 p.m. EST -- Incumbent Bernie Sanders is on track to win in Vermont's Senate race, ABC News projects, based on exit polls. 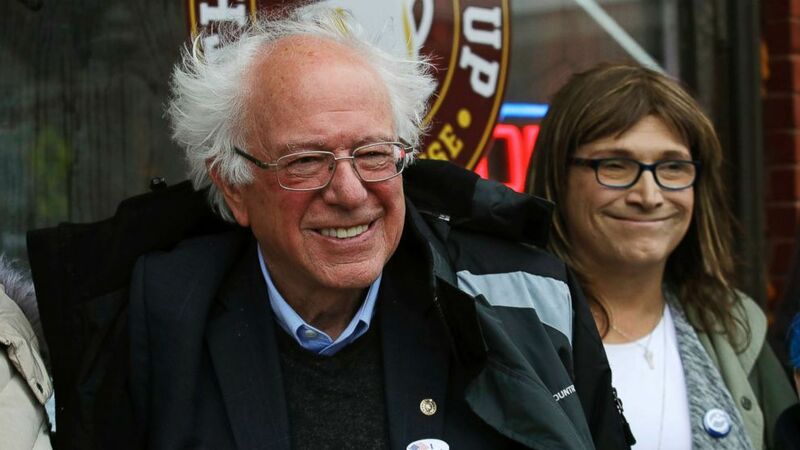 (Charles Krupa/AP) Sen. Bernie Sanders smiles as he poses for a photograph with Vermont Democratic gubernatorial candidate Christine Hallquist outside City Hall in Saint Albans, Vt., Nov. 6, 2018. Tuesday, 8:00 p.m. EST -- Polls are now closed in roughly half the country including these notable states: the rest of Florida, most of Kansas, most of Michigan, Mississippi, Missouri, the rest of New Hampshire, New Jersey, some counties in North Dakota, Pennsylvania and Tennessee. As noted, some states have extended polling hours. Tuesday, 7:53 p.m. EST -- Democrat Jennifer Wexton wins Virginia’s 10th Congressional District, per ABC News projections. Wexton flipped the seat against Republican incumbent Barbara Comstock. Hillary Clinton carried the area by six points in 2016. Tuesday, 7:51 p.m. EST -- Voting hours have been extended in some precincts in at least five states: Georgia, Illinois, Indiana, North Carolina and Texas. High-profile figures and candidates continue to tweet, asking voters to stay in line. Adding to the voices of Clinton and Gillum are Stacey Abrams, Lady Gaga and Beto O'Rourke. My name is Stacey Abrams, and I intend to be the next Governor of the great state of Georgia. Tuesday, 7:39 p.m. EST -- Greg Pence, the older brother of Vice President Mike Pence, has been elected to Indiana’s 6th Congressional District, per ABC News projections. Tuesday, 7:35 p.m. EST -- The polls are now closed in 9 states. At 7:30, polls closed in the closely watched states of Ohio, West Virginia and North Carolina. Tuesday, 7:19 p.m. EST -- Hillary Clinton and Democrat Andrew Gillum, who could become Florida's first African American governor, both tweeted to urge voters to stay in line because if they're still waiting after the polls close, they can still cast a ballot. Tuesday, 7:31 p.m. EST -- In Georgia, preliminary exit polls show turnout among nonwhites is a record 40 percent, including 30 percent black voters, in preliminary exit poll results. The previous high among nonwhites was 36 percent in 2014 – compared with just 18 percent in 1994. 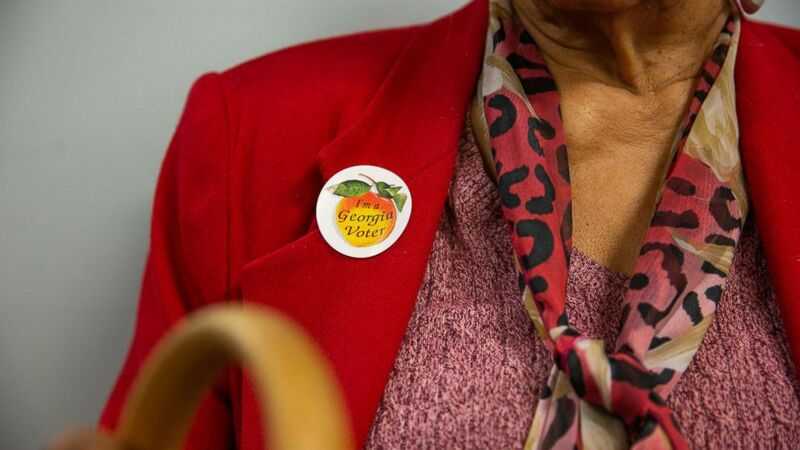 (Kevin D. Liles/Bloomberg via Getty Images) A voter wears a sticker that reads "I'm a Georgia Voter" at a polling station in Atlanta, Ga., Nov. 6, 2018. Tuesday, 7:17 p.m. EST -- President Trump and first lady Melania Trump are joined tonight by his three eldest children along with son-in-law Jared Kushner, Kimberly Guilfoyle and daughter-in-law Lara Trump, sources told ABC News. Trump's 2020 campaign manager Brad Parscale, his first 2016 campaign manager Corey Lewandowski and deputy campaign manager Dave Bossie are with him as well, the sources said. Trump's top White House advisers are also in attendance, along with longtime friends Tom Barrack and Richard LeFrak as well as several mega donors close to the president, the sources said. Tuesday, 7:00 p.m. EST -- Polls have closed in the first wave of closely watched states with competitive races: Indiana, Vermont, Virginia, Georgia, South Carolina and Kentucky. In Indiana, Democratic Sen. Joe Donnelly faces Republican challenger Mike Braun in a tight senate race, while in Georgia, Democrat Stacey Abrams faces Republican Brian Kemp for the governor's seat. Tuesday, 5:59 p.m. EST -- Trump's presidency and which party controls Congress are front and center for voters this election year, according to preliminary results from the national exit poll. Tuesday, 4:34 p.m. EST -- Dozens of young Native Americans marched to their local polling place on a reservation near Belcourt, North Dakota. The group of young men and women, members of the Turtle Mountain Band of Chippewa, carried signs that read, "Don’t disenfranchise us," as they chanted in unison, "North Dakota, you can’t do that!" 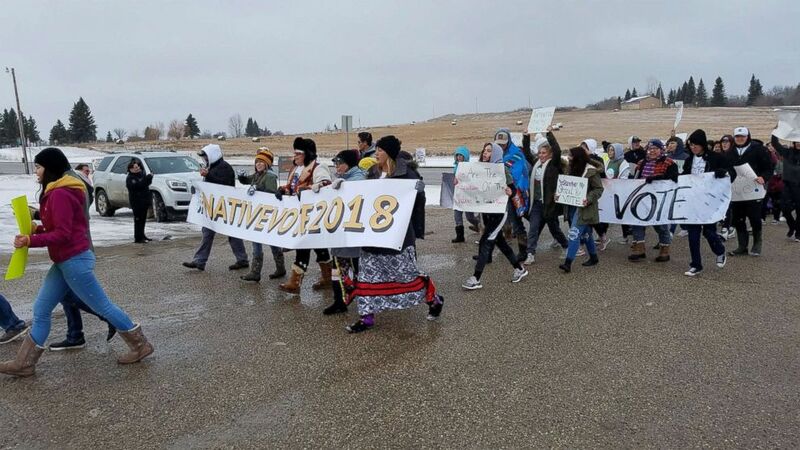 (Janice McDonald/ABC News) Native American youth from the Turtle Mountain band of the Chippewa marched from Belcourt High School to the Knights of Columbus polling place on the reservation near Belcourt, N.D., Nov. 6, 2018. Tuesday, 4:21 p.m. EST -- The issues with electronic poll books in Indiana's Johnson County have been "resolved," election officials said. "The issue in Johnson County, Indiana has been resolved, resulting in faster check-in times for voters," the company said in a statement Tuesday. "Earlier in the day, the poll book, which is used to check in voters but is not related to voting machines themselves, was running slowly. The poll book operation is now significantly improved. We apologize to voters and to elections officials in Johnson County, Indiana for longer wait times than expected, and we thank everyone for their patience." Tuesday, 3:50 p.m. EST -- Wet weather slowed voting at some polling sites in New York City. The city's board of elections said wet hands and clothing are apparently leaving ballots damp, causing them to jam in the voting machines, a city official told ABC News. Dry, crisp ballots are better to run through the machines. Election officials were already anticipating higher voter turnout and knew there would be a good chance of long lines, the official told ABC News. They urged voters to be patient. Tuesday, 3:41 p.m. EST -- A 104-year-old woman cast her vote Tuesday. Margaret Norwood is 104 years young, & she just cast her vote at UDC Bertie Backus. Ms Norwood was alive at a time when women did not have the right to vote so please take the time to vote today! Tuesday, 3:19 p.m. EST -- Multiple high-ranking sources in the White House and outside advisers close to Trump told ABC News they are bracing for an interesting evening. All of the sources believe it is most likely the House will be in the hands of Democrats after tonight’s results. One source told ABC News the reality is if there is good news for Republicans, the president will take all the credit; however, he already knows he will get blamed if it’s not a successful night. Tuesday, 2:52 p.m. EST -- Electronic poll books were malfunctioning temporarily on Election Day in Johnson County, a midsize Indiana county south of Indianapolis. 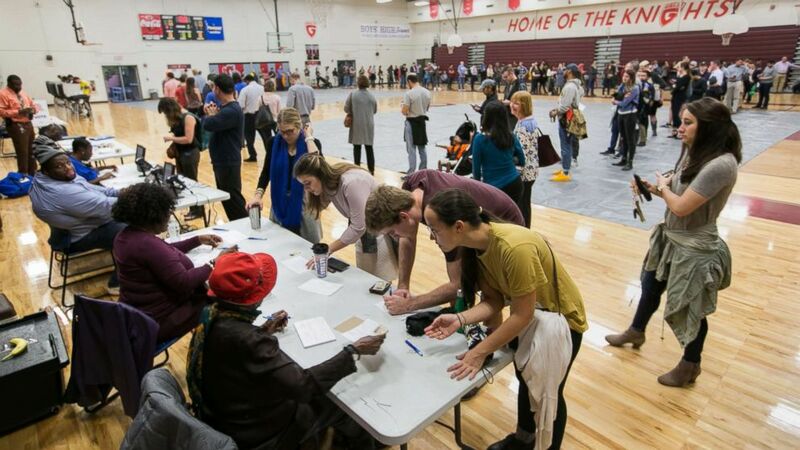 The poll books which are used to check in voters were running slowly during part of the afternoon because of overpopulated servers, the county clerk said. Johnson County is in a congressional district considered safe for Republicans, with incumbent GOP Rep. Trey Hollingsworth expected to hold his seat against Democrat Liz Watson. But the Senate race in Indiana is considered competitive, with Democratic incumbent Joe Donnelly trying to beat back a challenge by Republican Mike Braun. Tuesday, 2:27 p.m. EST -- Outgoing Republican Rep. Darrell Issa of California, who did not run for re-election, predicted a Democrat would win his seat. "Quite frankly, we know the results already," Issa told Fox News in an interview. "It will be a Democrat representing La Jolla to Solana Beach for the first time in a number of years." 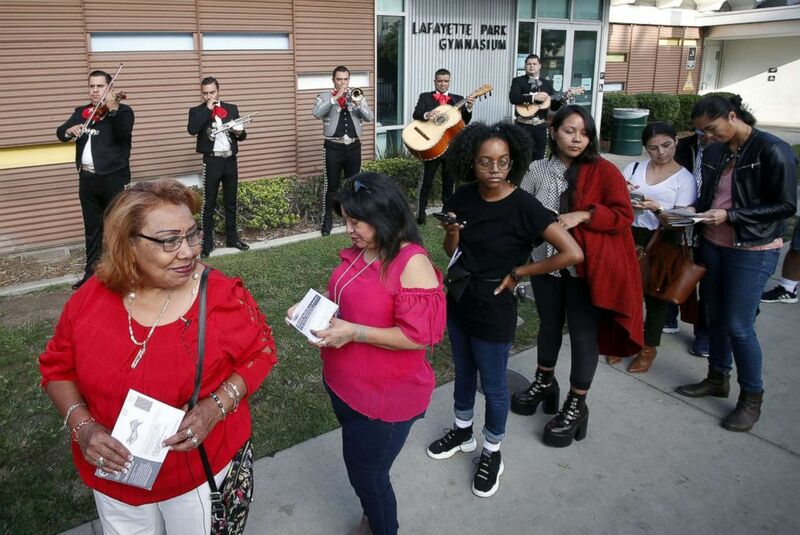 Tuesday, 1:56 p.m. EST -- Los Angeles voters waiting in line at one polling station at least got serenaded by a mariachi band. (Mike Nelson/EPA via Shutterstock) Latino voters Griselda Sanchez, left and Evelyn Franco, second from left, wait in line while being serenaded by mariachis at the Lafayette Park Gymnasium polling station in Los Angeles, Calif., Nov. 6, 2018. Tuesday, 1:49 p.m. EST -- Federal authorities aren't seeing anything out of the ordinary on election a Department of Homeland Security official said. There has been a typical scanning and probing of some election systems, but authorities haven't seen an "uptick" in cyberactivity, the official told reporters Tuesday afternoon. 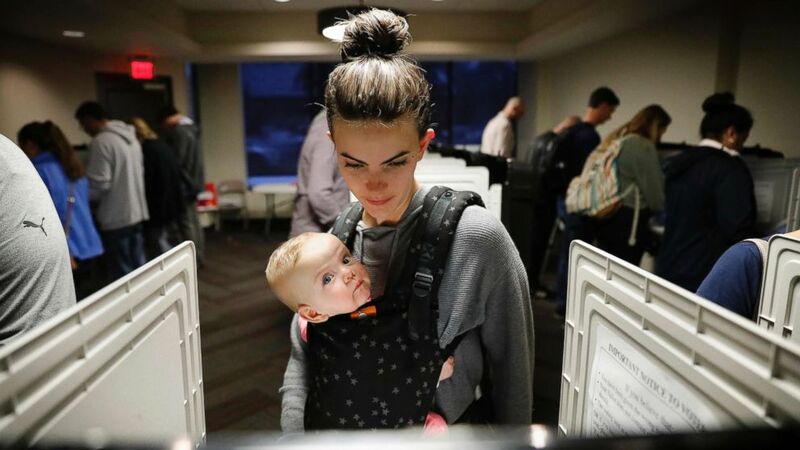 (David Goldman/AP) Kristen Leach votes with her daughter, Nora, on election day in Atlanta, Nov. 6, 2018. Tuesday, 1:20 p.m. EST –- Two high school seniors were excited to cast their ballots for the first time Tuesday in Georgia, where Democrat Stacey Abrams and Republican Brian Kemp are running in a close race for the state's highest office. Grace and Claire, both 18, of Decatur, said they spent a lot of time researching candidates before deciding who to vote for. "It was hard to find an unbiased source, but we did as much research as we could," Claire told ABC News. "It feels good to finally have my opinion out there." "I’m very excited that I got to vote this year," Grace told ABC News. "It’s a right that I’m very proud of." Georgia set a record for early voting this year, with 2,079,351 people in the state who cast their ballots before polls opened Tuesday, according to data from the Georgia Secretary of State's office. (Jessica McGowan/Getty Images) Voters line up to cast their ballots at a polling station set up at Grady High School for the mid-term elections, Nov. 6, 2018 in Atlanta. Tuesday, 1:00 p.m. EST -- Polls are now open across all states, including Hawaii. Tuesday, 12:27 p.m. EST -- Some Arizona voters will be treated to a cute, cuddly surprise at the polls. "It’s funny, you see people see the puppies, and they just melt," Bretta Nelson of the Arizona Humane Society told ABC News in Phoenix, adding that it's also a "unique way to get our puppies adopted. 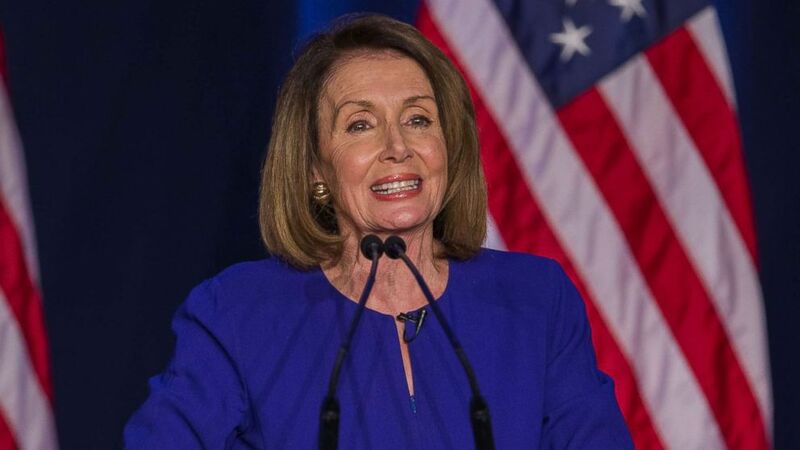 Tuesday, 11:59 a.m. EST -- House Minority Leader Nancy Pelosi is confident Democrats will win control of that chamber of Congress in Tuesday's election. When asked at a press conference if she is 100 percent certain her party will become the majority in the House of Representatives, the California Democrat said, "Yes, I am." Tuesday, 11:32 a.m. EST -- Trump retweeted a tweet he had initially posted Monday morning that warned about "illegal voting." The tweet reads, "Law Enforcement has been strongly notified to watch closely for any ILLEGAL VOTING which may take place in Tuesday’s Election (or Early Voting). Anyone caught will be subject to the Maximum Criminal Penalties allowed by law. Thank you!" (Brendan Smialowski/AFP/Getty Images) A view of Capitol Hill, while voters across the United States participate in midterm elections, Nov. 6, 2018, in Washington. Tuesday, 10:49 a.m. EST -- Humid weather is reportedly causing problems in some election precincts in North Carolina. North Carolina's state elections office said it has received reports that ballots in some precincts in Wake County and other areas cannot be fed through tabulators. But officials said "procedures are in place for these types of events." "Initial reports from county elections offices indicate this issue is caused by high humidity levels. When ballots cannot be ready by tabulators, they are stored securely in 'emergency bins' and will be tabulated as soon as possible," the board said in a statement Tuesday morning. "All ballots will be counted." Tuesday, 10:20 a.m. EST -- Democrats in Florida voted prior to Election Day in slightly higher numbers than the state's Republicans. Tuesday, 10:03 a.m. EST -- Newspapers across the United States splashed headlines conveying some of the emotion and tension around this election. - The Columbus Dispatch: "It's up to you now"
- Connecticut Post: "Midterm mania grips nation"
- Chicago Tribune: "A fight for control"
- The Des Moines Register: "IT'S DECISION DAY"
- The Detroit News: "Battle for Congress spirited until the end"
- Houston Chronicle: "DAY OF RECKONING IS HERE"
- Los Angeles Times: "Trump's reputation is on the line"
- The Oregonian: "Ready or not, it's finally Election day"
- Orlando Sentinel: "FIERCE RACES AWAIT DECISIONS"
- The Washington Post: "Uncertainty rules as the midterms reach the wire"
Tuesday, 9:46 a.m. EST -- Mark Salter, longtime aide and speechwriter for the late Sen. John McCain, a Republican, urged his Twitter followers to "vote for the Democrat (in most cases)." "That feels weird to write," Salter tweeted. "But the bigger the rebuke of Trump the better for the country. Resist." McCain was one of Trump's most outspoken Republican critics. The Arizona senator died in August at age 85 after a yearlong battle with brain cancer. Tuesday, 9:17 a.m. EST -- Former Secretary of State Hillary Clinton, the Democratic candidate who ran against Trump in the 2016 presidential election, made a final appeal to voters. "For the past two years, we've watched this administration attack and undermine our democratic institutions and values. Today, we say enough," Clinton wrote in a series of tweets. "But we won't just vote against radicalism, bigotry, and corruption today. We'll vote for fantastic candidates all over the country—including a historic number of women—who want to raise wages, fight for justice, and help more people get health care," she tweeted. "If they win, they’ll do great things for America. Let's exercise our birthright as Americans today, put those people in office, and continue the hard work of saving our democracy. It'll take all of us. Happy Election Day." Tuesday, 7:43 a.m. EST -- Authorities in some states are warning voters to be vigilant about possible election problems. The New Jersey Department of State urged residents via Twitter to beware of "false information regarding your polling locations." ABC News' Luke Barr, Chris Donovan, Katherine Faulders, James Hill, Jonathan Karl, Kendall Karson, Adam Kelsey, Meghan Keneally, Whitney Lloyd, Pete Madden, Janice McDonald, Meridith McGraw, Matthew Mosk, Victor Ordonez, Steve Osunsami, John Parkinson, MaryAlice Parks, Patrick Reevell, Deborah Roberts, Lissette Rodriguez, John Santucci, Benjamin Siegel, Trish Turner, John Verhovek and Scott Withers, David Wright contributed to this report.